Your Wedding is a Story - We're Your Storytellers. I've been speechless twice in my life . . .
"When my husband asked me to marry him and the second was when I saw the absolutely stunning wedding video Pixel Dust Weddings had created for us." Heidi S.
Worth a Million . . .
Pictures may be worth a thousand words, but a wedding video is worth a million! 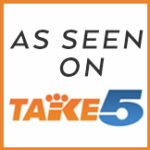 A small wedding video company that wins BIG, thanks to satisfied couples and happy wedding vendors. 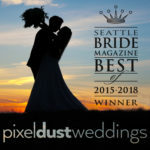 Awarded Seattle Bride Magazine’s “Best Wedding Videographer” 4 years in a row. Our mission is to document the happiest day of your life. Our unobtrusive professional videographers capture those moments and produce custom-made, multi-camera, cinematic wedding videos for you and your loved ones to keep and share forever. every detail and see those moments you would have otherwise missed. I have been speechless twice in my life...When my husband asked me to marry him and when I saw the absolutely stunning video Pixel Dust created for us. A concern I had about filming at my wedding is that it’s just too much. Not the case with Dani. She’s like a chameleon. I didn’t even know she was there until a wedding video arrived in my inbox. We absolutely LOOOOOVE our highlight reel! Tears, laughs, and butterflies while watching it! You really captured the essence of our love for each other. I normally feel uncomfortable being photographed/videotaped but I barely knew they were there!